In this guide I'll show you how to get the best digital photography printing results from your home printer. I'll also outline the importance of using the right ink and paper - and not necessarily the manufacturers own expensive inks and paper! There are five things that will affect the quality of your digital photography printing at home. These pages on digital photography printing, and digital-photography-tips.net itself, are updated regularly. To learn out about the updates as they happen subscribe to the digital photography blog, and this site’s RSS feed. Is home printing worth it? If you are in any doubt that your ink, paper and printer might not be up to the job, then you should consider using a professional print company. I have outlined the reasons for this on my digital photography printing home page. The main reason for using a professional service is that that's what they do, it’s their business, they do it day in day out – you probably don’t! I don’t want to put you off completely, but . . . I have gone through many printers and spent hours perfecting my digital photography printing. I came to the conclusion a while ago that no printer I can afford will ever match the professionals’. 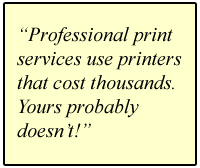 After all, my printer cost a couple of hundred pounds, theirs' cost thousands! So I gave up printing at home. I still have a printer for the occasions when a quick photo is needed, but not for anything more. If you’re still keen – read on to find out how to achieve the best you can from home digital photography printing. Rubbish in = rubbish out! Right, we’ll start with the photograph itself. You will need a good quality digital photography image in order to get top quality digital photography printing. It's like the old computer programmers' saying - "rubbish in = rubbish out!" Don't worry too much though. Good quality digital photographs are easy these days. If your camera has 3 megapixels or more then you should be fine. If you want to really go for the absolute best quality, read my page on setting up Photoshop correctly. You don’t have to do this, it’s only for the real perfectionists! Shortly I will be adding Photoshop tutorials on how to improve your digital photographs before printing, so subscribe to the digital photography blog, and this site’s RSS feed to be the first to hear when they are ready! How many different inks can a printer need? Once you have your image, check your printer. It probably says “photo” on it. This suggests to you (naturally) that it is suitable for digital photography printing. It will work, certainly. Some work better than others though. The thing to look for is the number of ink cartridges. two cartridges (1 x black, 1 x colour) - it’s a basic photo printer. four cartridges (1 x black, 1 x red, 1 x yellow, 1 x blue) - still a basic printer. six cartridges (as above, plus 1 x magenta, 1 x cyan) - good quality. more than six (as above, but with light black, gloss . . .) - top quality! The reason I have explained this? Don’t expect a two cartridge printer to produce eight cartridge quality. Follow the rest of the advice here to get the best possible results from digital photography printing at home, from whatever printer you have. Normal photocopier paper won’t produce good digital photography printing results. The ink bleeds into the paper. You end up with fuzzy edges in your photographs. You need to get coated photo paper. This is definitely more expensive, but worth it! They are plastic coated so that the ink doesn’t bleed into the paper. Printer manufacturers will tell you to use only their paper for the best digital photography printing at home. If you can, do. They know how their printers work and make the paper to match. However I have had excellent results by using paper from a different manufacturer. It’s often cheaper too! My advice – just make sure the paper is coated photo paper, you won’t go far wrong. If you want the absolute best digital photography printing at home then you will have to buy the manufacturers own inks. If you have a Canon printer, buy Canon ink; Epson printer, Epson ink . . . you get the idea. The big downside – cost. Manufacturers own inks are really, really expensive. I have had good results by using compatible cartridges made by third party manufacturers. They basically copy the originals. They can’t copy the formula for the ink inside the cartridge though. That secret is closely guarded! But they do a pretty good job. You are unlikely to notice the difference between third party inks and original manufacturers inks unless you are comparing them side-by-side. If you want to save a lot of money you can try refilling your old cartridges. You can buy kits to do this. There is a syringe and ink in the kit, and you basically inject ink back into the cartridge. This method is the worst option, and it can get messy! My advice? For the absolute best quality digital photography printing at home, go for the original cartridges. A good second best are the copied cartridges. Use the refill kits only if you need to print in colour a lot and you don’t mind the hassle - or the mess! Printers need a little help too! If you have done all of the above then the last step towards top quality digital photography printing is the printer set up. This is a little more involved and I want to show you some screen shots of how to set your printer up correctly to help you get it right. Go to my top quality digital photography printing - printer setup page for more on the correct printer set up. Need some more printing tips? For more on how to get the best results, go to my printing home page. I've outlined there why it is a good idea to use a professional print service if possible, plus more advice on how to correctly prepare digital photography images before printing.